Starting drawing in a new sketchbook is always exciting. It reminds me of that feeling of "this year everything will be better and much much tidier" I used to have as a child at the beginning of a new school year, when all notebooks were still virgin. I sort of have the impression that the first drawing in a new sketchbook gives the tone for the rest of the pages. That is why it is exciting to start drawing on the first page. I of course tagged Hahnemühle, the producer of these 15 x 15 cm sketchbooks I feel so comfortable with. By now I have tried all of them. And I will tell you here about it. First the Reports + Art Book. After so many square sketchbooks I might have found my new favourite sketchbook and I could be ready to say good bye to the little 15 x 15 cm format. I "might". The thing is that this elongated 15 x 21 cm book is still small enough to take it everywhere but it offers a more comfortable area for the hand to rest on while drawing. With the smaller ones it happens very quick that you have to draw with your hand in the air, no having space on the page to rest. 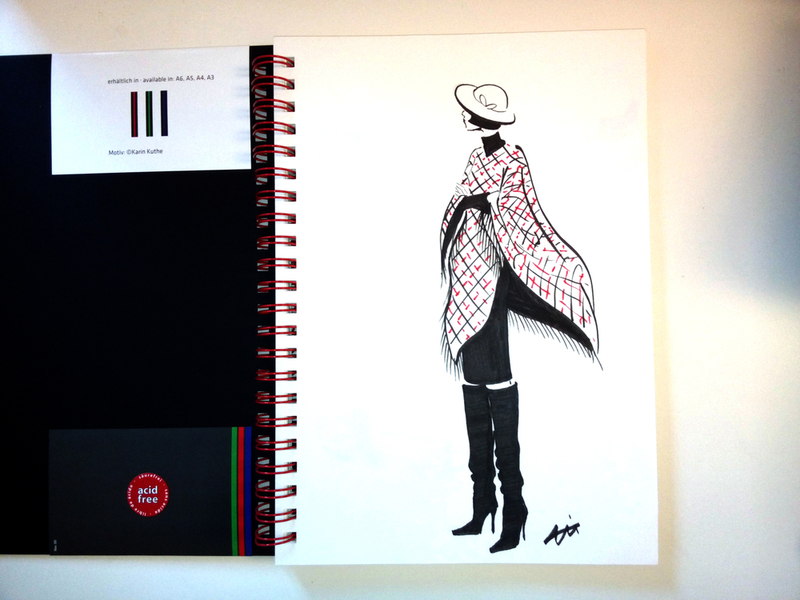 And this format is delicious for fashion illustrations, usually narrow and tall. I have tried it with different materials and the paper is suitable for dry media like markers and for wet one like watercolours, without going through. I like to use only one side of the page, in case I have to scan it, but you definitely can use both of this sketchbook. The second one I tried is the Style Sketch. Talking about fashion illustration: this one gives you the full space of a DIN A4 sheet (although you might buy it in other formats). The paper is not so thick as in the Reports + Art Book, but it is whiter, which gives more contrast to the drawings. I tried it with normal markers and it works fine, but the Copics go through the paper (this actually happens with most of the papers). I haven't tried this acid-free paper with watercolours yet but that media is not listed in the description of the sketchbook, so I guess it doesn't work especially well. The spiral bound is always handy to get really flat surfaces, very interesting if you take photos of your art (no need of finger or clip fixing the page). And this is the third one: the Sketch Diary, for text and art. The left hand pages are ruled for personal notes and pages and the pages on the right are blank. I must say this is the one I have used the least, because I am not in a phase where I write that much. But if you like sketch journaling as I did at the beginning of this year, after I had read this book by Dany Gregory, then this might be really useful for you. Or I could imagine it as a book for clients' projects, where you can write the briefing along your sketches. Maybe I should start using this book with that purpose. I tried it with a calligraphy fountain pen and with watercolour pencils. The former works fine but you have to be careful with the latter, water goes through the paper and is visible on the notes page on the other side. It remains useful though, so it does not ruin it and this fine paper enables a remarkably light notebook for its size and thickness, ideal to carry with you. It also has a practical pocket on the back cover to put notes, cards or that kind of souvenir inside. From all three my favourite so far is the Report & Art Book, the one I use the most. Which is your darling sketchbook?